by Chris Woodford. Last updated: June 10, 2018. Charging.... five hundred... clear! We've all watched it happen on ER dozens and dozens of times, but it's still relatively uncommon to see the same thing in real life. When someone collapses with a cardiac arrest, their heart can go into a kind of quivering limbo called fibrillation. One of the most effective ways to get it going again is with a sudden powerful electric shock—and that's the life-saving job a defibrillator does. Equipment like this used to require hours of training, but now portable, fully automatic defibrillators are being installed in public places so even amateur first-aiders can administer them with minimal instruction. Let's take a closer look at how these handy little gadgets work! Photo: Ready for action: You can't save a life with a defibrillator if there isn't one around to use. That's why many more of these units are now popping up in public places. This is a wall-mounted unit on a railroad station in England. Photo: Conventional CPR (heart massage and artificial respiration) can be invaluable, but may not be enough to save a patient without defibrillation. Photo by Suzanne M. Day. You might not think of yourself as having lots of muscles, but there's one super-powerful muscle in your body you absolutely depend on: the tireless blood pump in your heart. If your heart stops beating properly and blood stops flowing, your brain starts to lose its oxygen supply and you can die within five minutes. That's why people who suffer cardiac arrest (when their heart stops or goes into a dangerously abnormal rhythm) need emergency medical treatment. CPR (cardiopulmonary resuscitation) can help maintain the flow of oxygen to the brain, but getting the heart restarted and working normally often requires defibrillation with an electric shock. As the name suggests, defibrillation stops fibrillation, the useless trembling that a person's heart muscles can adopt during a cardiac arrest. Simply speaking, a defibrillator works by using a moderately high voltage (something like 200–1000 volts) to pass an electric current through the heart so it's shocked into working normally again. The patient's heart receives roughly 300 joules of electrical energy (about as much as a 100 watt incandescent lamp uses in three seconds). The kind of defibrillator you see on TV consists of an electric supply unit and two metal electrodes called paddles that are pressed very firmly to the patient's chest using insulating plastic handles (so the person using them doesn't get a shock too). The important thing is getting the current to flow through the heart, so where the paddles are applied is crucial. One way of applying them is to put one paddle above and to the left of the heart and the other slightly beneath and to the right; another method involves placing one paddle on the front of the body and the other round the back. 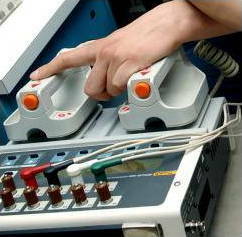 In order for the electric current to flow properly, and to reduce the risk of skin burns, the electrodes have to be applied close enough together. They must also make good electrical contact with the skin, so a solid or liquid conducting gel is usually applied to the patient's chest first. 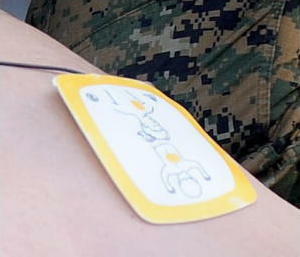 In units designed to be used by less-trained people in public places, sticky, self-adhesive electrode pads are often used instead of paddles for safety and simplicity: once the pads are stuck on, the operator can stand well clear of the patient's body and that reduces the risk of their getting an electric shock. 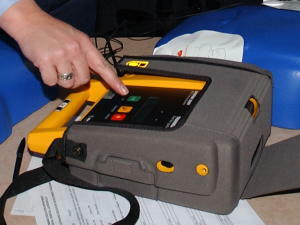 Photo: Two different ways of applying the charge: 1) Conventional paddles on a manual defibrillator. Photo by Christopher Hubenthal courtesy of US Air Force. 2) Self-adhesive electrodes (with printed graphics showing you where to stick them to the patient's body) on an automated defibrillator. Photo by William Greer courtesy of US Army. Chart: Why we need more public defibrillators: the chance of surviving an out-of-hospital cardiac arrest increases the more quickly defibrillation is used. Data from a study of 1732 cases in North Carolina by C.M. Hansen et al, 2015. You might have noticed that there are lots more defibrillators in public places than there used to be—and there have been calls for them to be as commonplace as fire extinguishers. The reason is simple: if someone collapses with a cardiac arrest, immediate defibrillation, even by an untrained bystander following step-by-step instructions, dramatically increases the chance of survival, compared to delayed defibrillation when the emergency medical services eventually arrive. A 2014 Australian study found the survival rate to be 45 percent compared to 31 percent; very favorable outcomes have also been found in studies in Osaka, Japan, Los Angeles, California, the UK, and elsewhere. 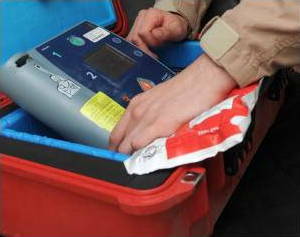 Photo: A portable external defibrillator packed away in an ambulance. Photo by Charles Larkin Sr courtesy of US Air Force. The units you're likely to see in railroad stations and other public areas are called automated external defibrillators (AEDs) and they're designed to be used with little or no training. They have self-adhesive electrode pads and a built-in computer that automatically analyzes the patient's heart rhythm to figure out whether a shock will help them (defibrillation doesn't work if the heart has stopped beating altogether) and, if so, what level of shock is appropriate. The units you see in TV hospitals and ambulances that feature handheld paddles and gel applied to the skin are usually manual external defibrillators. With these devices, the doctors, nurses, or paramedics have to figure out themselves whether defibrillation will help and also what shock voltage or energy level to use. Semi-automated defibrillators can work either automatically or in a manual override mode if the doctor prefers. Patients who suffer regular problems with their heart rhythm sometimes have an internal defibrillator permanently implanted into their chest (a bit like a pacemaker) or worn on the surface of their skin under their clothes. Units like this constantly monitor the heart rhythm and deliver a shock whenever it's needed. Photo: Modern defibrillators are simple enough for anyone to use. They speak instructions out aloud, telling you exactly what to do. Photo by Susan Cornell courtesy of US Navy. It's great to invent —to be celebrated as a genius and, if you're lucky, make your fortune! But it's even better when the thing you invent saves lives. Professor Frank Pantridge (1916–2004), a doctor from Northern Ireland, was a life-saving inventor. In the 1960s, he realized that many people were dying unnecessarily because they typically experienced cardiac arrest at home, at work, or in some other public place. By the time they'd been taken to a hospital where there was a defibrillator to kick-start their heart, it was already too late to save them. To solve this problem, Pantridge developed the first "portable," battery-powered defibrillator in 1965. Portable was something of a misnomer since it used huge lead-acid car batteries and weighed about as much as a person (70kg or 154 lb)! Even so, it could be carried around in ambulances, which gave a few valuable extra minutes to save people. Another of Pantridge's important insights was to realize that anyone could use a defibrillator with only very basic instruction; that eventually led to the development of the small, easy-to-use, automated defibrillators (weighing just a couple of kilograms) that are now installed in their millions in public places around the world. Frank Pantridge believed defibrillators should be as commonplace as fire extinguishers, since human life is far more important than property. His vision and determination saved—and continues to save—countless lives. Frank Pantridge, the 'father of emergency medicine' by Peter Crutchley. BBC News, 3 October 2016. Commemorating the inventor of the portable defibrillator. Frank Pantridge: British Medical Journal (BMJ). 2005 April 2; 330(7494): 793. Obituary: Professor Frank Pantridge: Daily Telegraph, 29 December, 2004. Defibrillators: An alternative guide from the British Heart Foundation. How does your heart work? : A simple introduction from the National Institute of Health. Cardiac arrest: Background information from Medline Plus. Learn CPR: You can do it! : Simple, illustrated life-saving guides from the University of Washington. St. John Ambulance Guide to First Aid and CPR by St. John Ambulance. Random House, 2001. A practical home first-aid guide. Implantable Cardiac Pacemakers and Defibrillators by Anthony W. C. Chow and Alfred E. Buxton (eds). Wiley-Blackwell, 2006. A detailed guide for physicians. 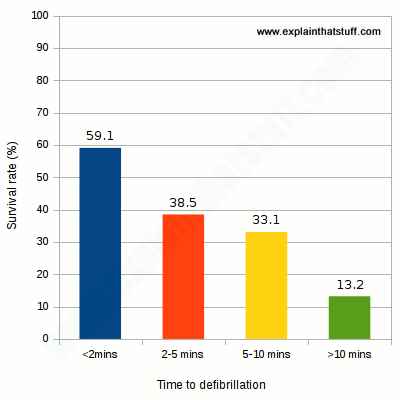 Chances of surviving cardiac arrest in England 'dire' by Denis Campbell. The Guardian, 19 November 2012. Poor public knowledge about CPR blamed for low heat-attack survival rates. The Shocking Truth About Defibrillators by Mark Harris. IEEE Spectrum, March 2012. There are thousands of public defibrillators, but according to this article many are prone to malfunction, putting lives at unnecessary risk. Public heart shock scheme success: BBC News, 18 July 2008. 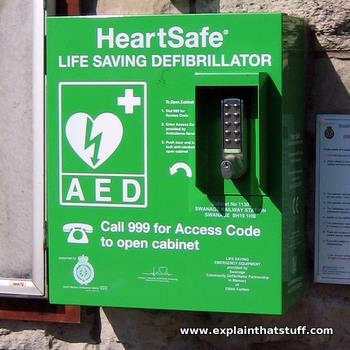 How lives have been saved by installing defibrillators in public places in the UK. Could a Defibrillator Have Saved Tim Russert? by Tara Parker-Pope. The New York Times, June 19, 2008. The death of a TV presenter prompts questions about the availability of defibrillators. How to Use a Defibrillator (AED) A four-minute introduction from St John Ambulance. How to Use an Automated External Defibrillator: A good, simple, 5-minute overview of using a defibrillator from monkeyseevideos. AED defibrillator demonstration: Although this is a manufacturer's advertising video, it gives a good overview of the various features you'll find on a typical machine. US Patent #4,090,519: Defibrillators by James Francis Pantridge and John Anderson. A technical description of Frank Pantridge's portable defibrillator from his patent granted May 23, 1978. US Patent #5,474,574A Automatic external cardioverter/defibrillator by Errol G. Payne et al, Cardiac Science, Inc.. A typical modern defibrillator, patented in 1995.